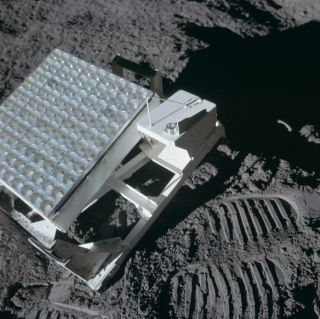 The Apollo 14 mission's retroreflector, as seen in place on the moon's surface. Glaze and Clarke did not provide additional details about the instruments onboard or the process of getting them there, but these reflectors won't be the first the agency has placed on the moon. In fact, retroreflector experiments are some of the continuing science gains of the Apollo program, which placed three such contraptions on the moon's surface. The Soviet Union's Luna program added another two such instruments.